excerpts from "ISLAM IN DAR ES SALAAM, TANZANIA"
Dar es Salaam was, for the greater part of the present century, the capital of historic Tanganyika, now the mainland portion of the United Republic of Tanzania. It is situated on the East African coast and borders the Western Indian Ocean. For most of the brief history of the locality "religion" has amounted to the predominance of Islam. Although Hindu, Christian, Sikh, Buddhist and "traditional" African religious communities always exerted differing degrees of influence upon it, the very name Dar es Salaam has Muslim connotations, and reflects the relative strength of several "sects" of Islamic provenance. Historically the vast majority of Muslims in Dar es Salaam have tended to belong to either the Shi'a community or to one of the Sunni sufi brotherhoods (s. tariqa, pl. turuq), each assuming a dynamic role in the propagation and institutionalization of the faith in the town. As early as the fourteenth century the feisty traveler extraordinaire Ibn Battuta recognized East Africa as an area of Islamic efflorescence. His trenchant observations regarding Kilwa, the jewel of the region, still may be read profitably as an indication of the religion's lasting roots. The tightly organized Shi'a communities have been primarily "Asian" in composition. Most of their members have ancestral links with the western coast of India, especially Cutch, Gujarat, Kathiawar and Sindh. In contrast to them, the sufi brotherhoods, so influential throughout the world of Sunni Islam, have been of Arab and African composition, most originating in other coastal areas like Brava along the Somali littoral or Hadramawt in Southern Arabia, filtering down the East African coast or mrima by way of Mombasa and Zanzibar. Among Muslims in Dar es Salaam ethnicity and nisba pedigree have been of prime importance. Rite followed determined communal affiliation. Rite was usually established by the manner and time in which Islam came to prominence within a given Muslim community and whether it was Sunni, Shi'a or Kharijia. Muslims of "Asian" origin were almost always members of Shi'a communities, either Isma'ili, Ithna ‘ashari, or Bhora (Bohora), while "Arab," "Afro-Arab" and African Muslims were as a rule Sunni, adopting either the Shafi'i or Ibadhi rite. Consistent with Islamic practice throughout the Dar ul-Islam, the center of each section of communities in Dar es Salaam is usually the neighborhood mosque. This has generally taken one of two forms, either the elaborate, well-financed limestone edifices located in the center of the town in the appropriately named Mosque Street, or the smaller more modest structures serving the peripheral areas like Msasani and Kinondoni, where local materials employed in msikiti construction are indicative of the relative wealth of the inhabitants. The range of variation is great indeed, with some as basic as a thatch Swahili-type house while others may be quite old and made of stone. Administration of these mosques has customarily taken the form of either communal ownership (strongest in the "Asian" Shi'a communities) or, what is more common among the Sunni groups, a kind of custodial control being exercised by the resident imam, who often has the prerogative of passing the mosque on to his eldest son. While computation of numbers for mosques in Dar es Salaam can be a difficult task, the few references enumerating these suggest steady growth, and this remains consistent with general population patterns. There are three major Shi'a communities in Dar es Salaam. These are the Ithna ‘ashariyya and two groups of Khoja Ismai'ili origin, the Ismai'ili or Nizari Ismai'ili and the Bohra (also rendered Bhora and Bohora) or Musta' lian Isma'ili. The progenitors of the present members of these communities originally converted from Hinduism. Relations between the variegated communities reflect in microcosm the major developments of Shi'a Islam elsewhere in the Islamic world. Khoja and Bohra merchants wielded great financial influence in Bombay and Gujarat, and used their wealth to advance the interests of Islam in early nineteenth century "British" India. In the past the Muslim traders of Gujarat were divided into three groups, Bohra, Khoja and Memon, the former two being Shi'a, the latter Sunni. The basis of the distinction separating Khoja from Bohra came in a split after the death of the Fatimid caliph Mustansir Billah in 1094 A.D. Each community has in its turn had a long and distinguished history of trading and settlement activity in the Indian Ocean region, climaxed in 1840 by the invitation of Sayyid Sa‘id, then Sultan of Zanzibar, to live and trade under the auspices of his regime. From the start, therefore, Muslims of Indian ancestry have played a major role in the development of the Dar es Salaam social formation. Khoja communities in India appeared as early as the fourteenth century when Persian Isma'ili holy men (piro) encouraged significant numbers of Hindus who had formerly been part of the Lohanna caste to embrace Islam. These conversions later became controversial, due to the alleged willingness of the piro to accommodate certain features of Hinduism in order to expedite the conversion process. This action was justified on the basis of the Shi'a doctrine of taqiyya, translated as "permissible dissimulation of real beliefs in difficult situations." When most of the Khoja responded to the call of Sayyid Sa‘id in 1840, the key figure in the then unified Isma'iliyya community was its spiritual leader the Aga Khan (Agha Khan), then residing in Persia. By dint of his authority the Aga Khan issued firmans, directives that required the strictest obedience from members of the Shi'a Imami Isma'iliyya community at peril of ostracism; Khoja property was also held to be under the administrative custodianship of the Aga Khan. In 1840, as a consequence of the altered climate of Iran in the wake of an unsuccessful rebellion against the Shah, the first Aga Khan fled to Sindh, later assisting the British in the Second Afghan War and in the conquest of Sindh as a result of which the Aga Khan was awarded a monthly pension of 3,000 rupees from the "British" Indian treasury. As part of the Anglo-Iranian accord the Aga Khan was not permitted to return to Persia. Consequently, he and his Iranian followers settled in Bombay among the Ismai'ili Khoja, the majority of whom then elected to accept the Aga Khan as their Imam. Following the invitation of Sayyid Sa‘id, members of several Shi'a Indian communities (many of whom had had lengthy and intimate religious, marital and mercantile connections with the world of Islam) began to settle in several coastal East African entrepots, some eventually migrating into the interior as well. Among the most favored of these sites was Zanzibar, the fulcrum of Western Indian Ocean commerce. 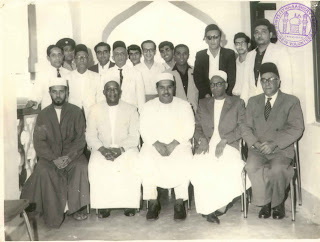 There Shi'a scholars such as Dewji Jamal and Abdullah Saleh Sachedina (students of the Bombay-based Mullah Qadir Husain), both of whom lived and worked in Zanzibar during the 1870s, became involved in proselytization on coast and interior in a manner similar to their Sunni rivals. In Dar es Salaam, for example, the first "Asian" trader is said to have been Shaykh Amiji Musaji, a Bohra who went to Mzizima, a predecessor of Dar es Salaam, in 1860, with Sayyid Majid ibn Sa‘id, the son and successor of Sayyid Sa‘id. From Zanzibar these learned Muslim waalimu and their disciples were instrumental in propagating Shi'a Islam throughout East Africa, first to Mombasa and Lamu around 1880, then onward to Bagamoyo, Lindi, Pangani, Dar es Salaam and Kilwa from 1880-1904. By the turn of the twentieth century, Ithna ‘ashariyya, Bohra and Isma'iliyya were well on their way to establishing residences in Tabora, Ujijji and Kigoma and Lake Tanganyika, to Arusha, Kondoa-Irangi, Singida, Moshi and Dodoma, as well as in diverse areas in Kenya, Uganda, historic Congo (now Zaire) and points further south. Dar es Salaam was crucial in facilitating this penetration for it was the entry point to the hinterland. An extremely important split had occurred within the Khoja sacred community in this period, however, bringing in its wake dramatic and unprecedented transformations. Prior to the transference of his headquarters from Iran to India, the allegiance of Shi'a Imami Khoja to the Aga Khan had been nominal, and distance had made it possible for his East Africa-based followers to fulfill their various communal obligations on a relatively informal basis. There had also been an attitude of broad tolerance for syncretic practices among Khoja, incorporating both Sunni and Hindu elements. Following the shift to India, however, the trend initiated by the Aga Khan was a gradual tightening of discipline within Khoja ranks, intended to purify Ismai'ilism of its anti-Shi'a and un-Islamic accretions. Because of the ongoing relationship connecting the "Asian" migrants in East Africa with their ancestral homeland, these changes necessarily affected the new Ismaili communities which sprang up in the shadow of Zanzibar, including settlers in a nascent Dar es Salaam. Influenced by a series of court cases involving the Aga Khan in 1866, 1894 and 1908, a small but significant number of believers of Khoja origin came to feel that the power of the Aga Khan and certain other features of Ismaili doctrine were objectionable and elected to secede from the community. As Muslims these Khoja felt obliged to belong to some Islamic collective, which meant joining another Shi'a aggregation. As a result, many of these seceders sought membership in the Ithna ‘ashariyya. The gradual process of individual defections from the Imami Isma'iliyya became a serious problem during the trial of 1894-95. This litigation centered around the commingling of property owned by the Aga Khan as custodian for the entire Isma'iliyya community. It had its roots in the court case of 1866 that had resulted in, among other things, the secession of five of the 450 Zanzibar Khoja families. They subsequently formed the nucleus of Ithna ‘ashariyya opposition to the Aga Khan, particularly regarding ownership of the Jamatkhana (i.e., "House of Assembly") and other communal property in common use among Isma'iliyya and seceders alike. The 1895 judgment gave Khoja the choice of remaining unconditionally allied to the Aga Khan or going their own way. Those preferring to join the Ithna ‘ashariyya lost their benefits as Isma'iliyya, specifically regarding burial rights. Population figures for members of these "Asian" Islamic groups suffer from the same kinds of inconsistencies plaguing statisticians in Dar es Salaam. Often these were outsiders incapable of differentiating between Indians; distinctions observed occasionally appear arbitrary. Goans and Baluchis, for example, fell into different categories, neither of which was considered "Asian"; therefore, these were enumerated separately. The earliest totals for people of Indian ancestry in Dar es Salaam treat them as a group. These are the estimates of Bartle Frere for the year 1873. Frere found a total of 107 Indians comprised of 47 Khoja, 45 Bohra, and 15 Hindus. Elton in 1874 tabulated 21 families, including "1 Wannia, 13 Battiahs, 1 Mooltani, 3 Bhoras and 1 Khoja." In 1886, Kitchener reiterated Frere's 1873 total of 107, reckoning a total population which he believed to number in the range of 5,000. Subsequent statistics pay less attention to groups within the "Asian" community with the exception of Seidel's estimate of 1898 showing 600 Muslims and 200 Hindus, and that of Schmidt for 1913 making mention of 150-200 Goans. By the turn of the century "Asians" as a whole in Dar es Salaam were averaged between about 900 and 950. Comparatively little is known about these "Asian" participants in the early life of Dar es Salaam other than that the majority were engaged in commerce, whether seasonally or as permanent residents. These traders were able to exert influence out of proportion to their modest numbers especially through financing safaris and caravans to the interior, several of which had been assembled in order to secure slaves for transport to Zanzibar. The involvement of people of Indian descent in the slave trade in the Dar es Salaam area seems primarily to have been related to usury, although Frere and Elton commented on a small portion of resident "Asian" slaveholders in Dar es Salaam. The major distinction which seems to have existed within the "Asian" community revolved more around settlement than religion, most Hindus apparently preferring to travel to and from India on a largely seasonal basis, while Muslims both chose on an individual basis and were encouraged as groups, particularly in the case of the Khoja, to settle permanently. The relative size of these communities probably made for a greater degree of cohesion than was possible in India itself where caste, faith and geographical origin were of greater consequence. The tolerance of the Sayyids of Zanzibar seems to have been shared to a significant extent by their mainland coreligionists. The role of various "sects" of "Asian" Muslims in Dar es Salaam during the interwar period appears to have been fairly independent from that of the African Muslims. These were accompanied by some of the ethnic and sectarian particularism which revealed itself in the succession of schisms common to both Shi'a Islam in general and the Khoja communities of East Africa in particular. At the same time it is evident that there was some degree of cohesion between members of various "Asian" communities, that transcended cultural, regional and caste barriers at crucial points during the twenties and thirties, most notably in the Indian Association, which consistently sought reform during these decades. Muslim activity, however, continued to follow much the same communal pattern as pertained throughout the nineteenth century. The possibility of a wider level of Pan-Islamic cooperation arose in the twenties with the advent of the East African Moslem Association, open not only to members of the various "Asian" communities but to African and Arab Muslims as well. The ostensible unity of the daring pioneering venture broke down in the thirties, however, the separate constituents lapsing backward into their previous identities, leading to a renewed reliance upon the communally-based assembly halls (jamatkhanas) which had been so central to the Bhora and Isma'ili. Many of the changes that occurred within these settings in the colonial period reflected bureaucratic pressures and preoccupations. Apart from descriptions of structural and theological innovation, the analysis of change among Muslims of Indian origin in Dar es Salaam has sometimes been fragmentary and hagiographical. Generally done by members of given communities, such studies have unearthed data concerning leading figures and pivotal teachers and their legacy to the improvement of the Islamic life of their specific segment of the town but have tended to replicate historically-rooted sectarianism. Isma‘ilis in Dar es Salaam as elsewhere in the coastal towns of East Africa still represent the largest portion of Muslims of Indian ancestry. Since the mid nineteen twenties they have been able to make their presence felt in Dar es Salaam through the formation of a strong interterrritorial organization capable of championing their interests. In 1926, for example, the Aga Khan established Provincial Councils in Uganda; these were subsequently followed by others in Kenya and Tanganyika. The councils sought to coordinate communal activities in the three British-ruled localities. Individual Muslims of Indian extraction have gained fame in Dar es Salaam as philanthropists since the era of German hegemony. During that period Sewa Haji Paroo, a millionaire wholesaler of Khoja background lent a measure of support to the Dar es Salaam school for Indians and Africans "intended for the free secular education of the poorer native classes." The Karimjee family, of Bhora origin, and the seemingly indefatigable Aga Khan, both financed projects of benefit to both Isma‘ilis and non-Isma‘ilis, including Africans. Prominent among these have been various educational educations such as the Dar es Salaam Secondary School for Boys, erected in 1939, from its inception providing for inclusion of up to one third non-Khoja pupils. Relations between "Asian" and African Muslims, like those of the two larger ethnic communities created by colonialism, have been mixed. It is undeniable that occasionally these have been marred by conflicts, many of which have been economic and political in nature. Of these many were nurtured by colonial authorities and their settler allies in order to deter manifestations of Islamic unity in the face of alien occupation. Two such threats could be seen in the misnamed "Arab" rebellion led by Abushiri bin Salim al-Harthi, waged against the imposition of German Rule in 1888 and in the notorious "Mecca Letter Affair" of the First World War. In each instance Islam acted as a unifying factor, although not effective enough to guarantee victory. Clearly, those precedents set by the Mecca Letter incident and Abushiri's Rebellion, when viewed alongside some of the instances of cooperation and philanthropy demonstrate that in spite of outbreaks of friction and the racialism aggravated by European occupation, real concern for the welfare of the local non-"Asian" population has been a recurrent theme among sectors of the "Asian" community; this has been especially evident in the more progressive leadership stratum. Some "Asians" were implicated in gun running during the Maji-Maji war of 1905-07 while others became casualties of the movement. One measure of the ambivalence of social relations between Islamic communities has been the thorny issue of miscegenation between Africans and persons of Indian backgrounds. An extremely complex matter, this seems never to have occurred on a large scale in Dar es Salaam, but certainly was not unknown. Historically, the sanctions against such choices have been great, including the risk of ostracism. While racial prejudice must be considered as an element here, local practice has long eschewed exogamous relationships among African, Indian and "Arab" communities. It is true, however, that the strongly exclusivistic tendencies characteristic of Indian communities seeking to retain their caste purity, a pre-Islamic accretion, made even inter-Islamic marriages among "Asians" appear as a serious problem. The offspring of Afro-Indian relationships were called jotawa in Gujarati and chotara in Kiswahili, opprobrious terms which meant half-caste. While multicultural, this group has been strongly African in identity, outlook and social relations, though often forced to exist in isolation. What an amazing article about the history of Khojas of Dar es salaam.I am a member of Ithna'asheria Community. It would have been more interesting if there was also a gallery of Photographs from our past. It has always been my dream to have our history recorded somewhere.There is a lot of iformation that lies idle in the archives of individual families. After having read this article, I am hopeful more people, like me, will come up with some sort of a joint effort to bring closer members of all the communities involved to initiate some kind of a museum or an archive where everyone will be allowed to contribute.This includes the Asians, African and Arabs and 'others' too. Many thanks once again to the author for his tremendous research and presentation.I believe he too will form part of our history now. It was my wish to know about the Muslim history in Tanzania. The writer has done a good effort to provide some basic information about Islam in Tanzania.